LANAI (HAWAIINEWSNOW) - What's the perfect place to tie the knot? For cat lovers Akane Shirata and Masayoshi Kamizono, it was in a field -- surrounded by scores of cats. 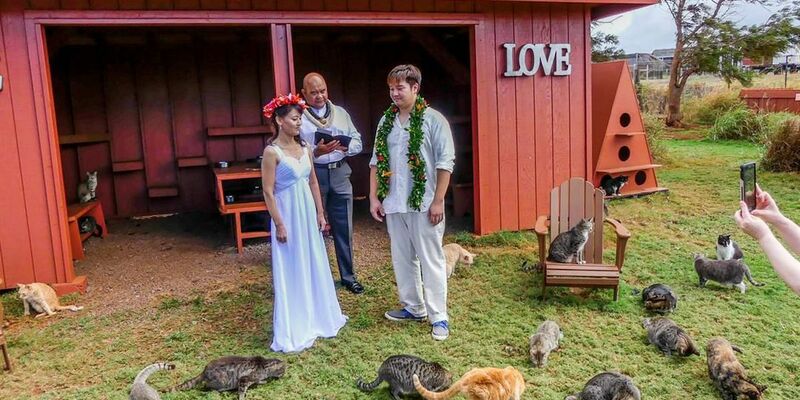 Shirata, of Japan, and Kamizono, of Washington, D.C., married Friday at the Lanai Cat Sanctuary. It's the sanctuary's first (and probably not last) wedding. And a good chunk of the sanctuary's 501 cats were on hand to watch the two say their vows. The two, who have five cats, could think of no better backdrop for their wedding. Neither could sanctuary head Keoni Vaughn. Vaughn said the sanctuary believes all cats "deserve the highest quality of life" -- and that's a message cat lovers can get behind. He added, "Our main goal, in addition to saving cats, is to also protect the native and endangered birds on Lanai."